The International Space Station travels around the earth at a speed of 28,000 kilometres and hour. That means that the astronauts on board ISS get to see 15 to 16 stunning sunsets and sunrises every day, in a 92 minute cycle. 2. What do they do inside the International Space Station? Basically, the ISS is a laboratory in space. Crew members are continuously conducting experiments in many fields, including meteorology, biology, physics and other disciplines in the microgravity environment of the space station. They are also conducting experiments that designed to test the equipment that will eventually be used for future visits to the Moon and to Mars. The International Space Station was built, in partnership, by the space agencies of the US, Russia, the European Space Agency, Canada and Japan. It has since been visited by astronauts and cosmonauts from fifteen different nations, making the ISS a truly international project. The ISS is the ninth space station to have orbited the Earth and to have been inhabited. Its predecessors included the Soviet Mir space station and the US Skylab. 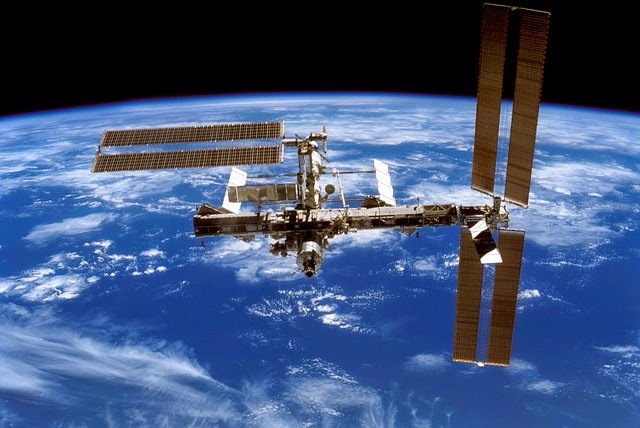 The International Space Station has been continuously inhabited since November 2000, which is the longest ever continuous human presence in space. There have been seven ‘space tourists’ who paid their own fare to take a vacation in the International Space Station. Mind you, if you do fancy a trip into space. It’s going to set you about back around fifty million dollars! The total space available inside the ISS is the equivalent of Boeing 747 jumbo jet. The space station consists of 14 separate pressurised modules which include storage space, laboratories and living quarters. 7. Where do the astronauts on board the ISS Sleep? The astronauts sleep in what is effectively, a sleeping bag tied the wall in a phone booth sized cubicle. It may not be exactly what you’d call luxurious accommodation, but with no gravity, they don’t need a mattress and the compartments do afford the astronauts some private space. 8. What do they eat at the International Space Station? Actually, the astronauts on the International Space Station get quote a varied diet that includes nuts, fruit, meat and seafood. They even get condiments like tomato ketchup and salt and pepper. The salt and pepper come in a liquid form, though, because you can’t sprinkle things in zero gravity. 9. Where do they get the water on the International Space Station? You’ve probably heard this one already, but they recycle anything that they can on the International Space Station and that includes the water. Water is recovered from the atmosphere inside the space station and, yes, from the astronauts’ urine too. The purified, recycled water on the ISS is actually more pure than the water you get from many domestic water supplies in the Earth. 10. When will the ISS be decommissioned? It is currently anticipated the International Space Station will be decommissioned in the year 2020. It’s too big and heavy to just leave up there though, because if left to its own devices, it would re-enter the Earth's atmosphere and could cause major damage on the surface of the planet. It is expected that some of the more modern modules of the ISS will be reused in a new space station and the rest will be sent on a controlled re-enter to Earths Atmosphere, somewhere out of harm’s way, over the ocean.